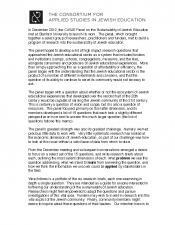 What follows is a portfolio of the six research briefs, each one examining in depth a single question. They are intended as a guide for anyone interested in furthering our understanding of the sustainability of Jewish education. Researchers might feel empowered to adapt the questions and pursue investigations of this vital area. Funders may wish to invest in research into this vital aspect of the Jewish community. Finally, community members might desire to inquire about these questions of their leaders.